me with such impetuous haste I will never know. things like growth charts and future school selection. can’t tell the difference between piece of cardboard and a toy. shellfish for her first two tender years. allowed a few paranoias once in a while (with a stiff drink on the side please). love oysters and would love to have her love them too. Mums, please feel free to give me advice! medium and add the butter to the pan. Let this melt and sizzle until most of the foam has subsided. – Add the ginger, garlic, and chilies and fry until the garlic is just a touch toasty in parts, under a minute. Add the leeks and mix in. – Immediately add the sambal and shrimps to the pan and toss well. Cover your wok and wait a couple of minutes, uncover, and toss again. Try to flip the shrimp so the uncooked parts are underneath and the bright orange cooked parts are on top. Cover again for a minute or less and repeat until all the shrimps are just cooked. You don’t want to overcook them so be vigilant! – Taste and season with salt as you like. Remove from the hot pan and serve immediately. on many things, but as part of the sauce for these shrimps it is amazing. bring…but I’m also going to enjoy it a bite and a morsel at a time. Hi, Joey! first of all, happy birthday to little C 🙂 your blog and the way you write about food and life is always a breath of fresh air and best de-stresser for me. Again, (I love saying this) thank you for being such an inspiration! 🙂 Happily verging myself on being 'the next' domestic goddess and that is because of you! I will have to try making this for the Little Ones, and of course myself. Happy Birthday to you Little C.
Happy Birthday little C! :) Those shrimps are fat! I hope to be a mother someday soon, and I hear that it's best not to feed them the allergenics in the early stages. Happy birthday to little C! 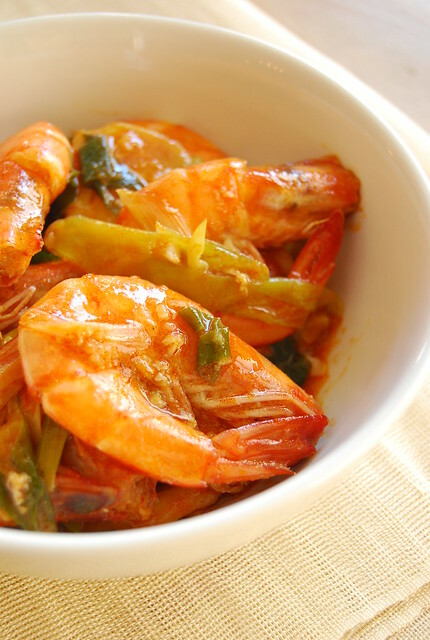 The Sambal Shrimps look delicious! Hi Eileen! Hope you like it 🙂 This may be too spicy for little ones so adjust as necessary! Hi Shalum! Yes, I read as well that we shouldn't feed them allergens too early, which is why I waited two years 🙂 We had a wonderful birthday weekend with her, thanks! Belated happy birthday to your wee bundle of joy, Joey! Oh, and those shrimps look sooo good. Wow. Two years already.. I can still remember you were pregnant!! But congratulations and I think shrimp are probably a good way to introduce someone to seafood. Leaving out the sambal seems a good idea though. Lol. oh happy belated birthday to little C! And sambal + prawns! Goooooood! Belated Happy Birthday Little C! I too love using sambal in my cooking… it looks yummy! I'd never heard about not giving shellfish in the early years, but it does make sense, since those are very allergenic. Not to mention, the threat of red tide, etc. So do you also not give her other highly allergenic foods, like peanuts? Thanks Anh! So happy with this sambal asli! Hi love cooking! You can definitely adjust the chilis to suit your taste…we love it spicy! Hi Katrina! Yup, the pedia makes us hold off on the allergens until 1 or 2 years – so yes, she hasn’t had nuts yet either. This year will be the year to try both nuts and shellfish! Anyway, there was a lot of food to discover this first two years aside from nuts and shellfish 🙂 Never got to try Malacca 🙁 See you soon!! First let me congratulate your little one. I also cannot believe its already two years. Second those shrimps look as Rosa said mouthwatering. Happy birthday baby!! Thos shrimps look delicious! Hi Lisa! Thank you 🙂 Wow, I am sure anyone would enjoy that bread and butter pudding! two already? so fast! happy birthday, little C!